They delivered the new Everest bi turbo and I purposely did not read a review or check the technical spec wanting to drive the vehicle, blind, as it were. It is a big car and the visual updates were not obvious from the start, apart from perhaps the front grill. It is an attractive looking car with clean lines and so I guess Ford decided that ‘if it isn’t broke, don’t fix it’. I am a freak of nature being 195cms and 115kgs with a stiff bad back due to five separate spinal operations. Being very long in the torso and back I have trouble getting into most sedans. Not so with the Everest where you step up into the vehicle. I climbed into the quality leather clad driving seat and the cabin looked and felt good. The dash was well laid out and the steering wheel was decked with buttons and controls. I pushed the new stop, start button and the dash and car sprang into action. I was impressed by the elevated seating position and the all round vision that the large side, front and rear windows afforded me. I adjusted the mirrors, steering wheel, seat and drove off slowly. In city traffic the car is impeccably well behaved and the smooth 10 gear automatic transmission glides the large heavy car along nicely. 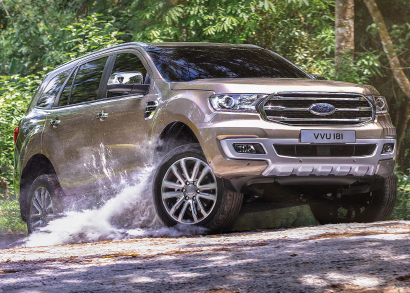 Ford has shown that smaller can be better by adding a 2.0 litre bi-turbo diesel engine to the range for this increasingly popular large SUV. There are of course many other versions but I drove the bi turbo on this occasion and I think that they got it right. Although this four cylinder engine is much smaller in capacity than the standard 3.2 litre five cylinder engine, maximum power increases 14kW to 157kW, while a hefty 500Nm of torque – up 40Nm on the 3.2 litre engine – arrives at 1750 – 2000rpm. The delivery is noticeably smoother and quieter, giving the 2.0 litre Everest a strong, flowing, easy-to-drive manner for a vehicle of this size and type. The new engine/transmission package is standard on the Titanium (4WD only) model. The 2.0 litre diesel uses less fuel than the 3.2 litre model, with a consumption of 6.9L/100km for the rear-wheel-drive model and 7.1L/100km in the four-wheel-drive. Everest engines require add-blue, a urea fuel additive that reduces exhaust emissions, to meet emission requirements (unlike its Ranger pick up cousin, which is classified as a commercial vehicle). Once up and rolling, the 10 speed auto does its job efficiently; the shifts are generally inconspicuous. With an extra four ratios it always seems to be in the right gear to make effective use of the engine’s strong low to mid range torque. 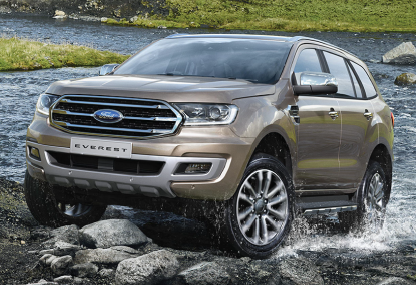 Everest is based on Ford’s Ranger pickup but was launched with a refined chassis and suspension set up to produce ride, handling and steering that are more civilised for a family friendly large SUV. Minor tweaking has further improved the dynamics. It’s a comfortable highway cruiser and does a good job around town. From its looks and feel, Everest means business. You climb up into it but the appeal of its spacious, practical cabin and the commanding view from a high, upright seating position is unquestionable. Instrumentation, controls and switches are all logically placed and clearly marked. Everest is now covered by a five year/unlimited kilometre warranty. If you are looking for a family SUV then look no further as I am sure that this version will become a class leader amongst the many other also rans.